At first to fulfill the need for safety for all concerned parties, if your kid is using a smartphone version. This version comes with a great feature for all risk patients: It can send SMS messages in case of critical levels to a trusted person automatically! If your child is away from home and tracks a critical reading the parents can get informed with a direct SMS message on their mobile phone. They can call back with instructions how to handle this situation. The trusted person and the phone number along with some more settings like the limits can be pre-defined by the parents even in a way that the kid cannot abort the SMS sending. The SMS function is available on Windows Mobile phones only! SiDiary will also increase the kid's motivation for the constant battle against diabetes: This was the reason to include a trend analysis with an easy to understand smiley based interface. 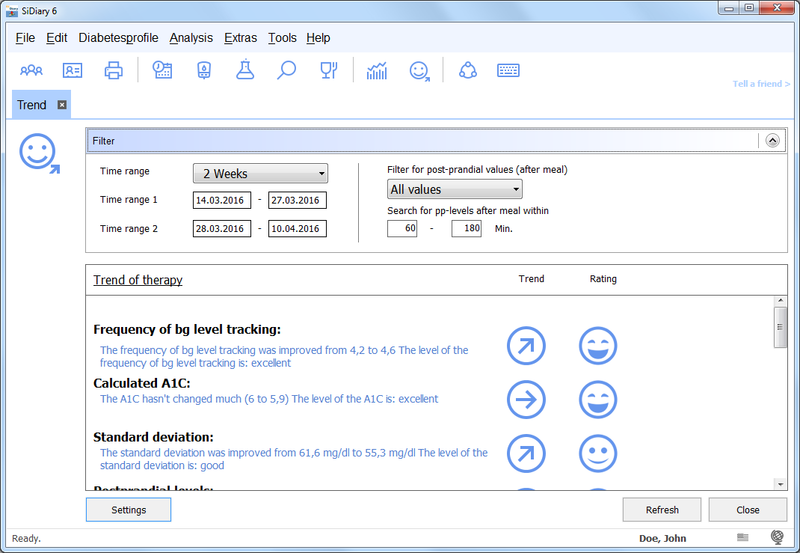 With the configurable limits for the rated parameters you can pre-define which ranges would be excellent, good, acceptable or inacceptable for your kid's condition. Because even the parents cannot know about all of the nutritions, the kids can lookup the nutrition database from the USDA even on the phone. The children can either choose to just sync it's favorite meals or to sync the whole database with thousands of nutritions! Tip: You should visit the website www.childrenwithdiabetes.com. You can read a lot of interesting things about this topic and also to get in contact with other parents and discuss your fears with them. A kid with diabetes is not a small grownup with diabetes!